Apple has begun to roll out new, interactive Apple Music posters that work with the Shazam iOS app to link iPhone owners directly to the featured artist's page in Apple Music. The new ads— which AppleInsider spotted on Thursday in Manhattan -- are aesthetically similar to the larger billboards Apple has been placing around the world in recent weeks, with a stylized Apple Music logo overlaid atop an artist's headshot. Only a small Shazam logo in the lower-left corner differentiates the interactive ads. 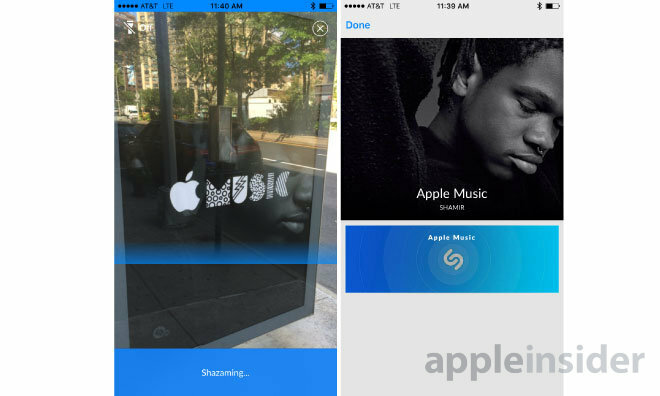 Scanning the ad with Shazam's image functionality will link the user directly to that artist's page in Apple Music. In our case, the poster featured On The Regular singer Shamir. The ads mark another evolution in Apple's partnership with Shazam, which expanded with the release of iOS 8. Siri can now identify songs via Shazam, with commands like "What song is this? ", "What is currently playing? ", or "Name that tune." Apple Music has accumulated 11 million trial members since its launch, and Apple continues to expand its content and features. Earlier this month, the company added a "Beats 1: Replay" feature to Connect that allows listeners to replay Beats 1 shows on demand.